Decent.bet combines cryptocurrency and blockchain technology with an industry known for making the big money. Before you write this one off as being just another bogus gambling platform, I think it’s worth it to take a better look. What makes Decent.bet different is the fact that they take the old familiar casino games and sports betting and make strategic changes for the players benefit. Before I continue you should know that Decent.bet has a no-profit business model. This means that the founders only make a profit if the value of their token rises. Of the profit that is realized by the founders share of tokens, 10% will be donated to a humanitarian cause at the end of every session (so every quarter). The cause will be chosen by a community vote and a vote by the founders. If you’re wondering why they would organize their company this way, you can check out their own youtube channel, called Decent Bet, where they explain that their motivations center around the fact that they’ve done well within the crypto space and they want to do their part to benefit others, and they enjoy gambling of course. Every quarter DBET token holders are given the opportunity to use their tokens to purchase what are called DBET house credits. These are essentially shares of the house. At the end of every quarter 100% of the profits made by the house are distributed among holders of DBET house credits according to their percentage of the house. There’s a couple reasons why I’m bringing this one to your attention, both of which run parallel to my own philosophy regarding cryptocurrency. 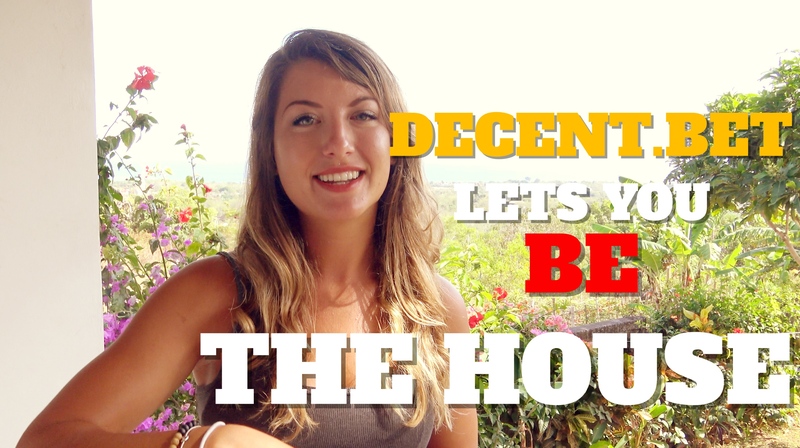 In addition to being able to introduce many more people to the crypto realm, the Decent.bet team wants to provide a platform that allows people to overcome the barriers set by their respective governments by giving them a way to make money and a means to store it. There’s no denying it, the world of gambling encompasses massive amounts of people, and there are many very successful gambling platforms that are reaping the benefits. However, they are not yet equipped with the transparency and verifiability that blockchain technology can provide. The long term goals of Decent.bet include what are called White Labelled Houses. This would allow gambling platforms- after being verified for authenticity and legality of course- to easily adopt what Decent.bet has built and provide it to their user base. This is where I can see that Decent.bet has true potential for exponential growth and also can introduce a huge amount of people to cryptocurrency and blockchain technology. The date for Decent.bet’s ICO has finally been announced, September 23, 2017 is the day it begins. There will be 4 rounds for this ICO, each round lasting 7 days, so this ICO will last 28 days. The first round offers a 20% discount, giving you the price of $0.10 per token. The second round offers a 10% discount, and so on until the last round the price per token equals $0.125. There will be no minimum or maximum investment limit, and you will be able to invest with Ethereum, Bitcoin, Litecoin and Dash. Check out this link to see how you can properly invest in their ICO. In case you’re still worried that this project is only an idea with no viable product yet, you’ll be happy to know that they will be offering a large selection of sports betting and a suite of about 5 different slot games at the launch of their ICO. I will be on this FOR SURE! At least $1000 dollars i'll invest. Cheers. @heiditravels Thank You for keeping me up to date and informed on Crypto Offerings. I Love your Positive Attitude and your Passion for everything Crypto. STEEM on Young Lady !!! Great content @heiditravels! Very interested to see how many real ICO are legit, what do you think about that @heiditravels? I can share this great video from @amerrosic! I really liked the video so i resteemit! I am enjoying a lot your video! Looking forward to your next ones! A very useful article @heiditravels, I learned a little bit about the development of the world cryptocurrency. Thank you for sharing this post with us all. So there is no mining for this coin? Correct, you can hold their tokens and participate in any increase in value that may come, deposit the tokens into the quarterly house and earn both casino profits and any increase in token value, as well you can use them on the gaming platform to gamble. Lots of options! I'm in on this one for sure! This ICO sound like a sure bet!!! You've convinced me to look further into this ICO. That's a lot of interesting stuff they're doing with the way the business is set up and the rewards. I was always a fan of Etheroll for their 1% house edge but wished they had other games besides rolling dice. @heiditravels, hi I really liked you video but I have a question: Was that video sponsered or your personal opinion to this ICO. I am always quite paranoid when it comes to investing in ICOs. But e.g. TenX was a great investment so far.. It might be interesting to get in on the ground floor of one of these ICOs. Steem the Dream! Sounds like a great idea, I will keep my eyes open. I love this. I had an idea of making a coin like this a few weeks ago. While I'm disappointed I won't be able to make one, i'm glad my idea was right! Seems like a viable innovative project! I'm going to keep an interested eye on them. I've Resteemed your blog & AMPed your vid. Yeah, definitely​ worthy of interest​. Hi! I am new here and I do not know very well how this works... I have seen you have just given me a vote and I have started to follow you and given you a vote too. I hope I have done it rightly and I hope you can understand me because my English is not perfect. Thanks. I become your fan after reading this article. This sounds like a great ground floor opportunity! Thanks for posting it @heiditravels! I have never put any money in an ICO, but I think I will bet some money on this one.